Taking her personal Group One tally in 2017 to three, Roly Poly just would not give in and kept responding to Ryan Moore's urgings. Moore had Roly Poly smartly out of the stalls and despite being unable to grab the far rail which Dawn Of Hope occupied, was always in a good position. Dawn Of Hope led briefly, but Roly Poly rallied and went ahead again and was able to hold off Persuasive by a length. 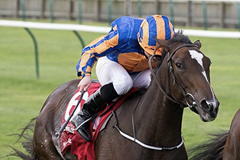 O'Brien said: "She's a great filly, with a great heart. She's tactical and tough, amazing really. "She's incredibly bred, out of a very good Galileo mare and by War Front, and the lads do a great job with her at home. "I think so (go to Breeders' Cup), the lads (Coolmore) will decide what they want to do, but her and Rhododendron could be trained for the Filly And Mare race if that's what the lads want to do." He added of being on the brink of reaching the late Bobby Frankel's world record of 25 Group One wins in a season: "It would be incredible for everybody, but the horse always comes first. That's the important thing - the horse always comes first. "After every race, the lads sit down and have a chat among themselves and see what race they want to pick, they have a big discussion with the people around them, make a target and we go with that. "It's race to race, horse to horse, the horse always comes first and we're doing our best in every race, it's all we can do." John Gosden said of Persuasive and Nathra: "They both ran superbly well. The winner on this ground was too good for us. "With a bit more juice in the ground, both of our fillies would have troubled the winner. They have run second and third and I could not be more thrilled with them. "They have run true and honest right to the end of the season. "I think that will probably be it for both of them and the breeding sheds beckon." Chris Richardson, managing director of Persuasive's owners, Cheveley Park Stud, said: "She ran a blinder, she just needs a bit of juice in the ground. We are just going to keep the door open for the Queen Elizabeth II Stakes. "If it came up soft and she was still in good form, it could be an option and we might just give her one more whirl." Fortune said: "It is a bit emotional, really. She is a very tough filly and could have done with a bit of juice in the ground, but she would have probably only been second, to be honest. "It is a nice race to finish off in."